I understand this is a special order and is non-returnable. 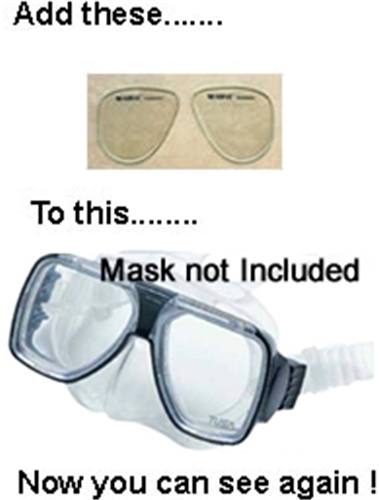 Have a question about the Corrective Lenses For Scuba or Dive Masks (Mask Not Incl.)? on 2/17/2011 Can you do bifocals? How much? on 6/8/2011 I have an old Cometpro Sporasub mask, are you able to supply corrective lenses for this mask? on 6/9/2011 Re: Prescriptive lens Do we use the "Sphere" or "Cylinder" readings? Also if a -3.75 reading, do we choose -3.5 or -4.0? on 6/9/2011 Hello, not being an optometrist I would suggest that you fax us your prescription and we will have them looked over and the appropriate version chosen for you. Keep in mind that astigmatism does affect the vision as well water column magnification. on 8/29/2011 I was going to buy these lenses for my tusa powerview 2 mask ...are they fairly easy to install on my own or will i need to take it to a dive shop? thanks. on 8/19/2014 Hello. I have a large head and was seeking your recommendation on a dive mask, one capable of being fitted with corrective lenses. Thanks in advance for your advice. on 8/21/2014 HI, So we can future discuss how to assist you a phone call would be best. 1-866-728-2293.
on 12/15/2016 I have an IST Corona M55 mask with prescription lenses. I had cataract surgery which has changed the required prescription. Can I buy a new lens and install it in the mask, or would I have to send the mask to you for installing a new lens? on 1/14/2017 Can I send you my mask Scuba Max Navigator plus my prescription and have you insert those lens? on 1/23/2017 Do you glue these lenses to the existing ones? Or replace the existing ones? I have Scubapro Spectra mask. My prescription is: Right +2.75 -0.50 065 Left +1.50 -0.50 050 What lenses do you recommend? on 6/4/2017 Hi, I'm planning to get the corrective lenses for the Scubapro Trinidad mask. Do you guys make one and ship to Malaysia?